Jose Mourinho interrupted the post-match interview of David Luiz and Eden Hazard after Chelsea's 2-1 win over Liverpool at Stamford Bridge. The Portugese Coach walked in and said David Luiz picked a yellow card deliberately so as to be able to travel to Portugal for the new year as the yellow card is his 5th yellow card of the season. 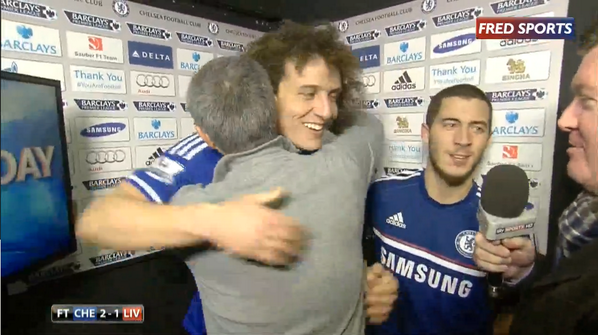 Jose Mourinho went ahead to congratulate both players and gave them a hug.